Move Human Performance Founder Chad Dunn has over 20 years of experience in the health and sports performance fields, originally from Colorado. Chad came to Arizona for the sunshine and competitive BMX racing. Having competitive bones and a fearless mindset, nothing has stopped Chad from conquering obstacles in life. Chad passes along these traits while working with and educating his clients or athletes. After studying kinesiology and Spanish at Arizona State University, Chad began his career working as an exercise specialist at a well known physical therapy and sports performance clinic in Phoenix. Chad has worked with patients and athletes of all levels, coaching them all to move and never give up. 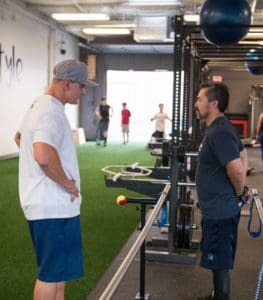 Using his motto “Mind Over Virtually Everything” Chads training gives athletes the competitive advantage needed in sports, the will to battle back from a catastrophic injury, or just succeed in life. Chads passion for helping others took a new turn while working with Eddy King. Eddy sustained a Spinal Cord injury and has battled back allowing him to walk again. Everyone under Chads care succeeds, failure is not an option. It’s not about the workout it’s about the lifestyle!! Chads hobbies include any extreme sport, playing with his English bulldog, watching people succeed, and hanging out with his wife Jackie and their three kids.